My recipe is very close to this one. Mine has brown sugar and applesauce instead of the seasonings! 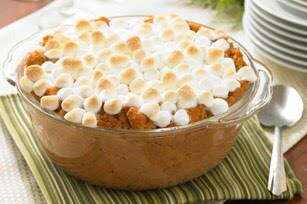 Everybody loves it even if they don't like sweet potatoes! Makes you hungry now!! Mmm, sweet potatoes! I am soooo ready for Thursday!!! Hope you have a great Thanksgiving!